The Lo Maan Liya Song Lyrics from ‘Raaz Reboot’, featuring Emraan Hashmi, Kriti Kharbanda and Gaurav Arora. Directed by Vikram Bhatt, the music has been composed by Jeet Gannguli. The lyrics of Lo Maan Liya has been penned by Kausar Munir. The song has been sung by Arijit Singh. 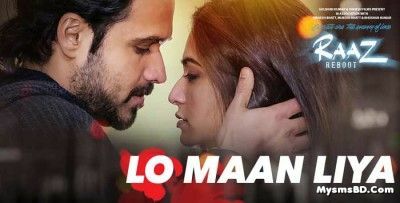 Search Feeds: New Exclusive Song Lo Maan Liya Lyrics From Raaz Reboot, Raaz Reboot Movie Song Lyrics, Lo Maan Liya Song Lyrics By Arijit Singh, New Song Lo Maan Liya Lyrics.